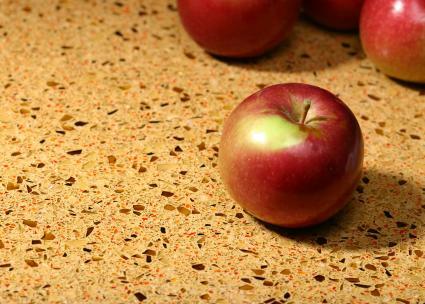 Recycled glass countertops are beautiful, durable, and earth friendly alternatives to traditional countertop materials. Made of approximately 90 percent glass mixed with resins, the surfaces are non-porous, easy to clean, and resist stains and bacteria. They come in a multitude of colors and designs, and because they are made from recycled materials, they are completely sustainable. A number of companies are making recycled glass slabs, giving you several options in color and style. Many countertop manufacturers already working with quartz or other slab materials have branched into working with glass. The method of production is similar; resins are used to bond together crushed particles of glass mixed with pigments, ash or ceramics. Every company has its own proprietary mixture, which produces unique results that can contain close to 100 percent post consumer recycled materials. They install similarly to any solid counter, including granite, marble, Corian or quartz. IceStone countertops are made up of just three ingredients: pre and post-consumer recycled glass, Portland cement, and resins. 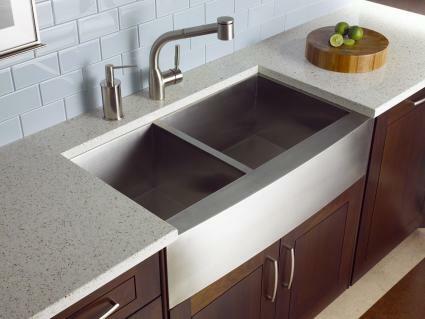 Their 3 cm thick countertops are completely non-porous and extremely durable. Styles range from brightly colored slabs with obvious, suspended chunks of recycled glass to muted, traditionally colored slabs that mimic the look of quartz counters. One IceStone slab covers roughly 35 square feet, and all of their counters have up to six available edge treatments. Pricing varies by color, style and edge treatment, but most slabs cost roughly the same amount as a mid to high-end stone counter, or with prices beginning at around $100 a square foot installed. All IceStone slabs must be fabricated and installed by certified fabricators; contact IceStone to find an installer in your area. Vetrazzo's zero VOC emission counters use more than 550 pounds of crushed recycled glass per slab. That glass comes from several sources, including traffic lights, windshields, and beverage bottles. Vetrazzo's slabs are made of 85 percent glass by volume, with each color blend made up of a signature palette that makes every slab a work of art. Vetrazzo's slabs are brightly colored, with large pieces of suspended glass and a high degree of variation within each slab. Rather than using synthetic resins, Vetrazzo's counters use a blend of cements and pigments to suspend their glass in. Pricing varies based upon the color of each slab, but most slabs range from between $100 and $150 a square foot installed. Vetrazzo is sold and fabricated through licensed installers only. Visit their showroom page to find a supplier near you. Trinity is the product of Tiger Mountain Innovations, the maker of Squak Mountain Stone. Their counters are made up of recycled glass held together with a low-carbon cement. Their 3 cm thick counters are subtle in color and design, with muted colors and tones that blend into the even the most conservative or traditional kitchen. Trinity is sold through authorized dealers only, and costs roughly the same as stone or quartz counters - or around $100 a square foot installed. Contact them for a dealer in your area. If you're looking for dazzling colors and slabs that contain either large or small suspended pieces of glass, consider EnviroSlab by EnviroGlas. 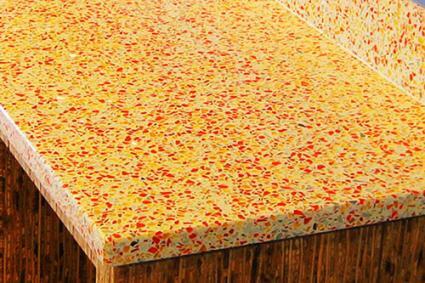 EnviroSlab is a type of terrazzo made into slab, or countertop form. It can be customized and made to order, allowing you to choose your blend of colors and glass fragments. Like all terrazzo, it can be shaped or molded to fit curves and other unique shapes. EnviroSlab is made up of 100 percent post-consumer recycled glass mixed with an epoxy resin. The resin makes the counters impervious to staining, scratching or bacteria, while allowing the counters to bend or shape to any installation. They also weigh less than counters made with Portland cement. Pricing is comparable to other high-end counters and starts around $100 a square foot installed. Contact EnviroGlas directly to find a certified installer in your area. Eco, made by countertop manufacturer Consentino, is a unique countertop made of a blend of recycled mirrors, glass, ash, resin and porcelain. Eco's colors are muted and subdued, with only the sparkle of the glass helping to bring them to life. Subtle veining and flecking in each counter helps add detail. Eco counters have received numerous certifications through LEED as one of the most sustainable countertop options available. Pricing for Eco is comparable to Consentino's other products, beginning between $100 and $150 a square foot installed. Contact them to find an authorized showroom in your area. With so many options for countertops available on the market, deciding on a relatively new product like recycled glass can be a challenge. These unique counters have some advantages over other materials, however, which can help make your decision easier. Recycled glass is one of the only truly sustainable countertop options available today. Stone counters like granite must be cut from the earth and cannot be replaced. Quartz, solid-surface, and laminate countertops that are produced from man-made materials often give off high levels of VOCs or are made from non-renewable resources, making recycled glass one of the only green building options available for counters. Recycled glass counters do not scratch, melt, burn, chip, or stain. They require no maintenance; clean them with your favorite products on your timetable. Unlike granite or stone counters, they do not require sealing or special cleaners, and unlike solid-surface or laminate counters, they don't show wear over time. In durability, the only product comparable is quartz, which often has high levels of VOCs. Glass counters are a completely unique product. The exact mix of glass particles changes subtly with each slab, making each countertop's design exclusive to the buyer. The pieces of glass suspended in the counter may be dull, polished, jagged or smooth, as well as varied in color and size, making each counter a work of art. Picking a recycled glass countertop has very few drawbacks. People who enjoy doing home projects themselves may be disappointed to learn that the countertops must be installed by an authorized fabricator. You can't purchase and install them yourself, as it voids any warranty. Additionally, expense is a consideration if you have a tight budget. Low-end granite is available for around $25 a square foot, while the recycled glass starts near $100. Building a green home is not an easy challenge, but with products like recycled glass countertops, the process become a little easier, as well as a little more beautiful. Create a sustainable design in your kitchen or bathroom by basing your layout on a recycled glass counter.